Begin this trip at the Manteno I-57 exit. The retention pond next to the highway. If the pond is dry, walk down the slope and separate the rock layers to find fossils. The exposure is in Niagaran age (Silurian) dolomitic limestone. The trilobite casts are harder than the country rock and leave high quality molds. 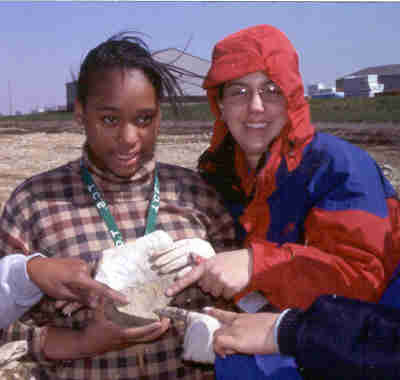 Yolanda points out her first fossils with Gabe Lyon (left) while Ashley holds her first trilobite (right). "We found thirteen trilobites, several ammonoids, hundreds of other trace fossils and millions of worm burrows," wrote Ashley in her notes. Sisters for Science is part of Project Exploration, co-founded by Gabe Lyon and Paul Sereno. We visited the retention pit at Manteno, Illinois on April 9, 2000. I was the only one who did not find a trilobite, but I found a 10-inch long ammonoid cast. Make a series of right turns to parallel the Kankakee River until you arrive at the parking lot at the pedestrian suspension bridge over Rock Creek. The rocks here are Niagaran age (Silurian) limestones and dolomitic limestones. 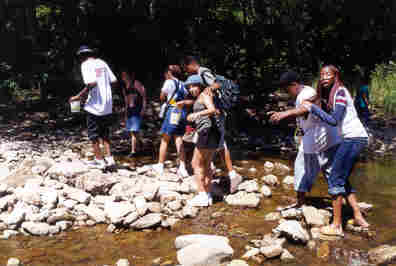 In summer, 1999 we visited the park with the Project Exploration Junior Paleontologists. This was the first time some of the JPs had been in water outside of a play park in their lives. Later, we discovered that invertebrates today live under rocks and in the water and had crayfish races. On the way out, Kit found his first trilobite in the quarried cobbles used for bank armor near the suspension bridge (above right). The Park also has stacks, joints, one fault, a waterfall, perched water table, many stream features and the Neda Oolite contact with the overlying limestone. 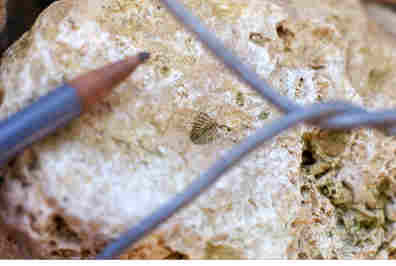 Fossils found here include both in-situ and loose ammonoids, reef building organisms and trilobites. 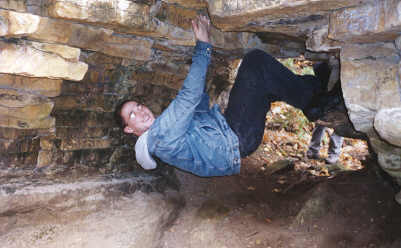 On the Fall, 1999 Northeastern Illinois University Sedimentology #317 field trip, Kevin Goldman climbed the "Kankakee Arch," the only limestone arch in Northeastern Illinois big enough to admit a person. 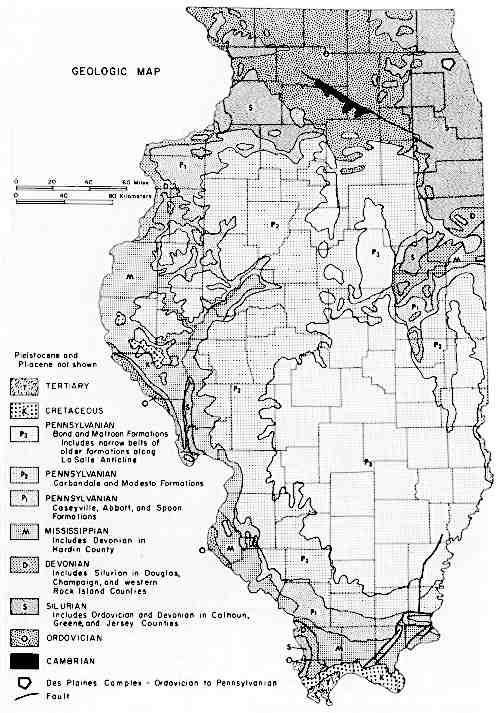 There is a structural feature also known as the "Kankakee Arch" which underlies the whole region. It was formed due to compressional stress at the end of the Paleozoic. 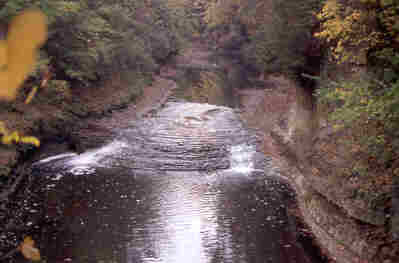 The waterfall along Rock Creek has cut a canyon through Silurian Niagaran Limestones (Sugar Run and Joliet Formations). Start at the pedestrian suspension bridge and walk north. Cross the road bridge either on the surface, or by observing the limestone to which its piers are anchored. There is a large ammonoid on the rock to which the north end of the bridge is anchored. If you can find it, leave it for the next person. It would collapse if you tried to hammer it out anyway. Once you are north of the blacktop, measure to find all the features. At about 225-235 feet you will be able to see a cave on the opposite side of the creek. At 455-465, looking down over the edge give a steep view down on a stack. At 1340-1365, you will be able to see the arch and the path to it. And at 3050-3060 feet, you will be able to see the waterfall. Two hundred feet further along, is a second path to the waterfall. Retrace your steps to the parking lot by following the old airstrip. Keep an eye on the gravel here; some lovely fossils come from this local crushed rock. 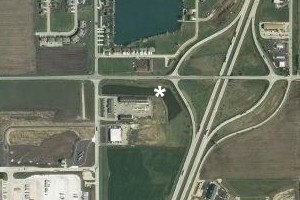 a topographic map of the Kankakee State Park area (Bourbonnais quadrangle) from Topozone. Select map scale of 1:25,000, view scale of 1:100,000 scale and centered on 41.1578N, -87.9272W. common Ordovician fossils from Willman, et al. 1975. LaSalle and Kanakakee geological column. Information from the Illinois State Geological Survey. Illinois State Geological Survey Guidebook to Kankakee has links to the Kankakee State Park and a stop at the Kankakee Torrent Rubble Bars in this field trip. The whole guidebook is available in paper from Illinois State Geological Survey - Publications. Check out the high and low points by clicking on Kankakee County from this page of all the counties in Illinois. Read Pleistocene Glaciations in Illinois from ISGS to understand the glacial erosion and deposition which covers most Illinois bedrock. Read the Trilobites Geobit to learn more about these vanished arthropods.